On the ground at Hostel Enjoy there is a reception with a large common room with a TV. On the first and second floor are the rooms. In the attic is the terrace connected with the second common room and a kitchenette for make some tee of coffee. Our young and friendly stuff will be at your service to help you to spend a nice vocation in a positive atmosphere. We speak English and Italian. The hostel is located in a quiet environment but close to the main street with all the bars, clubs. Is just 5 minutes walk to the Amphitheater and all the Roman monuments and the old par of the city. In the center you can take the bus to the amazing beaches. 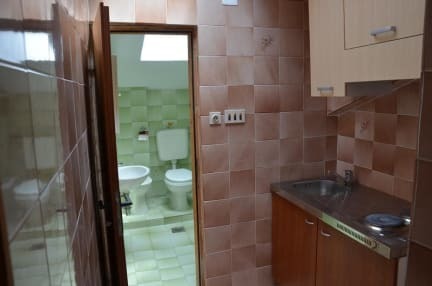 The Hostel Enjoy has double, triple and quadruple rooms. the Deluxe 4 bed mixed dorm room is equipped with a private bathroom with hot showers and air conditioning. Payment upon arrival by cash (Euro and Kuna). Our doors are always open. E-mail us for latest check in. The staff was very nice and helpful. The hostel was also very clean and felt homey. I can only recommend it. The rooms, staff and facilities are lovely! I would definitely go back again. Extremely friendly and helpful staff. Rooms were so clean and lovely. We came back to Pula for a flight home and decided to book here again as the first stay was so perfect! The staff was friendly, the room was clean with AC and a private toilet, and the location was close to the center. I loved Pula and can’t wait to visit again and stay at Enjoy. Very friendly staff and clean facilities. 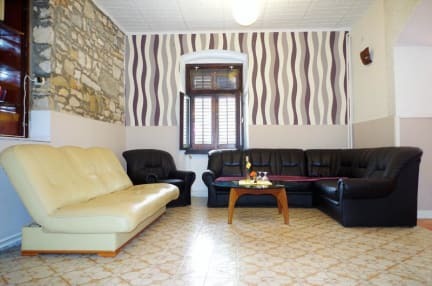 Location is a bit remote from the city centre but we booked it purposely as we wanted to stay closer to the airport rather than the centre of Pula. Can be a bit noisy if you're trying to sleep and other people are walking around we could hear everything in our room. Greeted by a lovely guy at reception who was very helpful and showed us around the hostel. Environment was laid back and met some nice fellow travelers. The kitchen only has one working hob and if you try to turn both on it trips the power so that made cooking time consuming when multiple people wanted to use the one hob. Air con worked great. Overall no complaints.